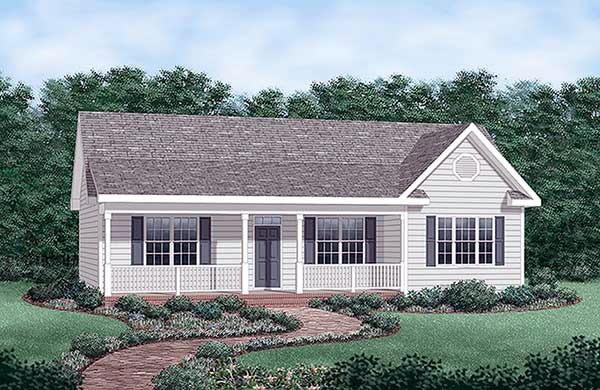 Easy and affordable construction in this 3 bedroom, 2 bath , 1258 sq ft ranch home floor plan. Smart design maximizes every square foot of this small house plans space. Question: If I want to build this plan multiple times, what is the cost for each additional license? How long will it take to do the truss roof system? Answer: The additional license fee is $200 if you buy the PDF and do not need sets, we also sell an additional license at $300 which include four sets of printed plans. We have the truss version drawn so there should not be a delay. Answer: Hey, We show the electrical and plumbing fixture locations on the floor plan. 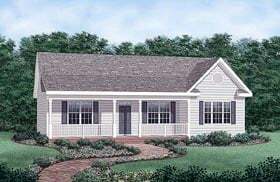 We give detailed wall sections, roof and foundation plan. 4 elevations. front porch and deck detail. Window and door schedules. Question: Do you have any pictures with plans that have the basement? Answer: I am sorry, I do not. Answer: We can modify plan for 2 x 6 walls. Call for pricing. Question: Is this available in 2x6 walls with basement? Answer: We can design it that way. We charge to change the walls to 2X6. Click Here to download a free PDF Brouchure of Plan Number 45476.